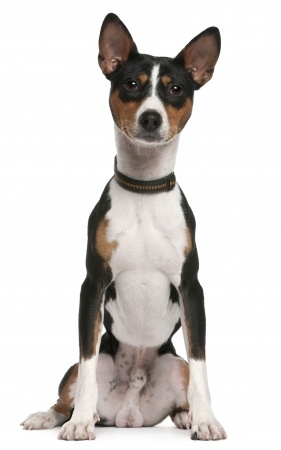 The Basenji is a very unique breed of dog for many different reasons, both physically, and emotionally. One of the most unique characteristics that stand out from the others is that the Basenji is a “barkless” breed. 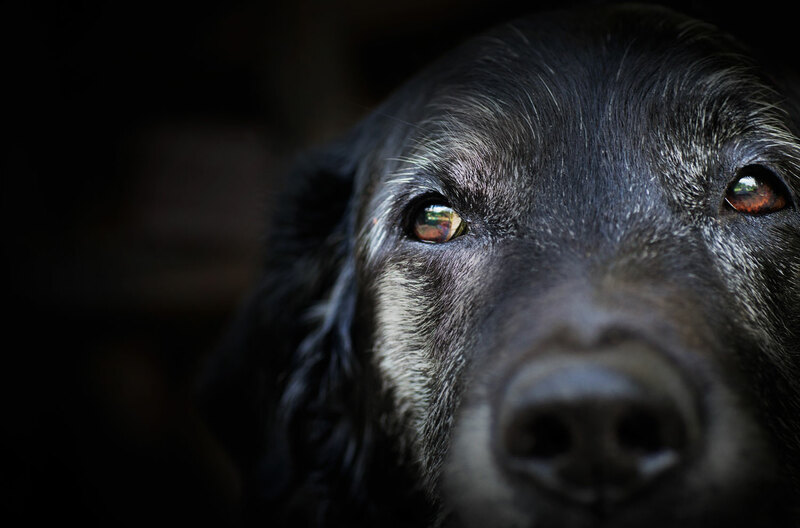 They do not bark like other breeds of dogs, but with this being said, they are not entirely silent. These guys have a uniquely shaped larynx, which instead of a “bark” produces more of a yodeling sound, also called a barroo. This is a very curious and alert breed of dog, but they have the tendency to be reserved when it comes to strangers. Make sure you properly train and socialize your Basenji at a young age so they are not spooked or intimidated by strangers when they are an adult. They tend to love kids, but may not be good around very young children. Adult supervision is always advised when dogs interact with very young kids, so no one gets hurt. They are classified as hounds by most major kennel clubs and can be considered to be both a sight and and a scent hound. This means that they may take off unexpected while outdoors. With this in mind, they should always be kept in a securely fenced area or on a leash. They are not the most ideal dog for the novice dog owner. 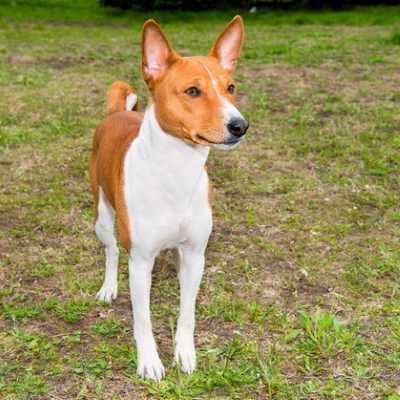 This is an ancient breed of dog, and the Basenji is actually argued to be the world’s oldest dog because they appeared in Egyptian hieroglyphs and art. They are originally from Central Africa and were brought up the Nile River as gifts for the Pharaohs. Drawings of what look like a dog very similar to the Basenji were found in Egyptian tombs, and wall drawings dating back thousands of years ago. Although this breed is originally from Central Africa, rumor has it that its ancestors are descendants from Asian wolves. They were initially used in Africa to act as guides for the natives, as well as warn off dangerous animals and drive small prey into their burrows and nests. In fact, this breed is actually still used in Central Africa by the pygmies to hunt lions. In the 1980s, the breed was almost entirely wiped out in the United States due to a fatal genetic kidney disease called, Fanconi Syndrome. 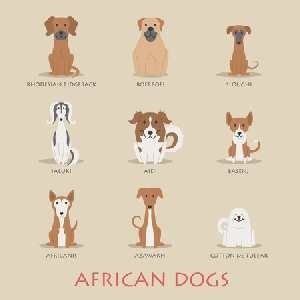 Fortunately for us today, Basenji breeders traveled to the Congo to retrieve more dogs to help try and diversify the gene pool, which is the reason we still are able to enjoy the company of these furry friends to this day. This breed was introduced to England in 1937 and adopted by the American Kennel Club in 1943. The breed is ranked 84th in popularity with the AKC in 2015. 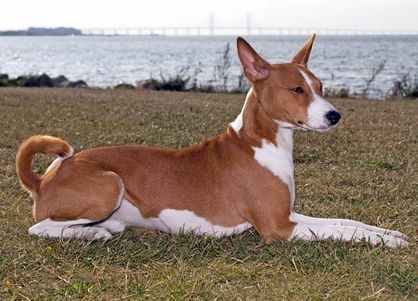 According to the American Kennel Club (AKC), the Basenji has four standard colors and one standard marking. White feet, chest, and tail tip are all standard markings according to AKC, along with brindle markings. This is a breed of dog that requires early socialization and training because they can tend to be reserved around strangers, and may not get along well with other pets that are not dogs. Basenjis are very alert and curious, as well as intelligent. Therefore, they do respond well to training with a strong desire to please. 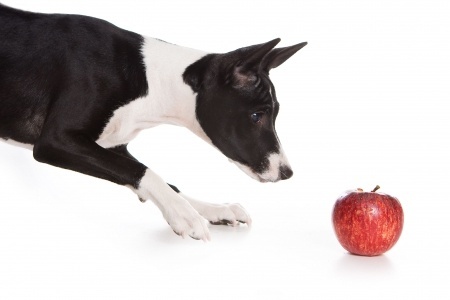 Some people debate their ease of trainability, but nonetheless, this is a smart dog, and with proper, positive, consistent training, and lots of yummy treats, you will be able to train your dog without too much trouble. Keep in mind that this dog does not respond well to yelling or punishment such as hitting. You must be patient while training any breed of dog, but especially this breed. It is crucial that if you are thinking about adopting a Basenji you know what is in store for training. These guys need a firm trainer who is confident and consistent. It is critical this dog knows who is in charge, and who is being trained so they do not develop behavioral problems. As long as the trainer firmly displays leadership, your Basenji will be on its way to being a well-behaved, friendly member of your family. The Basenji make excellent watchdogs due to their high level of alertness, and loyalty to their owner. Even though they have shy tendencies, they usually latch on to one family member and stick by their side through thick and thin. Although they do not bark, they will howl or “yodel” to alert their family of strangers or any suspicious behavior that they may suspect. This breed makes a very keen watchdog if that is something that interests you. 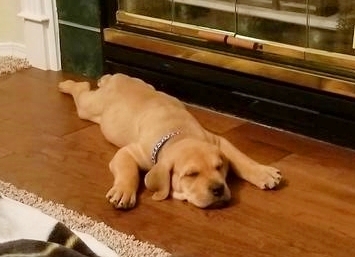 If you are looking for a breed that will serve both as watch and guard dog, this is not the one for you. Their small size makes them an unlikely candidate for guard duty. Intruders are not likely to be intimidated by the presence of a 20-pound dog. If you are looking for a dog that you don’t need to devote a lot of grooming time to, then the Basenji will the absolutely perfect for you. With short, soft hair, this dog has little to no shedding, which is ideal for people with allergies to animal hair. They are very cat like in the sense that they primp and groom themselves to keep clean, so brushing and bathing are very minimal. Regular check up of ears, eyes, paw pads, teeth, and nails are recommended, as with all breeds, but routine maintenance is minimal. Beyond that, nails do need to be clipped and teeth brushed to maintain good dental health. The Basenji’s primary health concern is Fanconi Disease, which is a genetic kidney disease that causes the kidneys to fail to reabsorb nutrients and electrolytes. This is the disease that almost made the breed extinct in the past. This breed is often used as characters in movies and books, such as Goodbye, My Lady by James H. Street, and the radio program, This American Life. Dog Breeds Expert always recommends that you do as much research about a breed before you decide to adopt one or find a breeder. There are many good sources out there, but we've picked the books below - just click on the image to find out more.